Last week was Spring Break for Jake and T. To “celebrate”, my folks got us a free room at Harrah’s Rincon Casino and we had a staycation. The resort is far enough away to feel like you’re out of town, but still close enough to home. 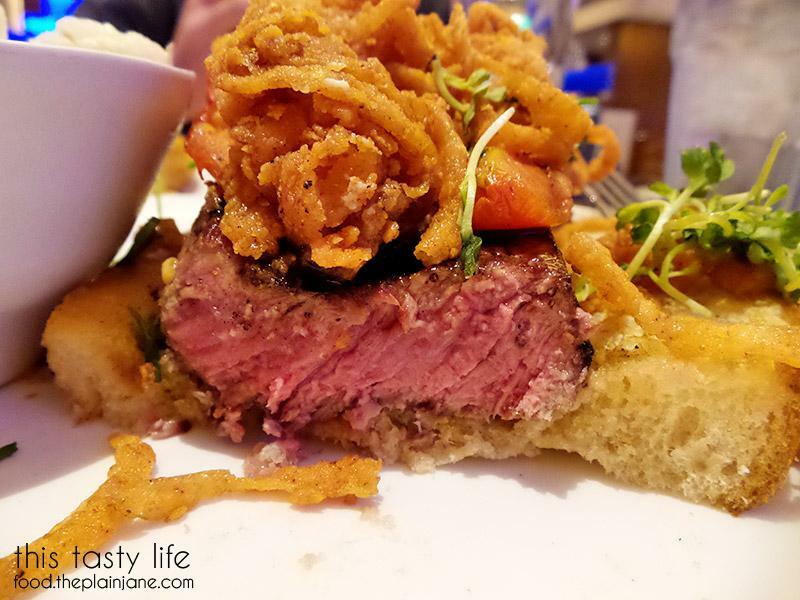 On our first night we decided to have dinner at The Cafe at Harrah’s Rincon – one of the sit down restaurants at the resort casino. 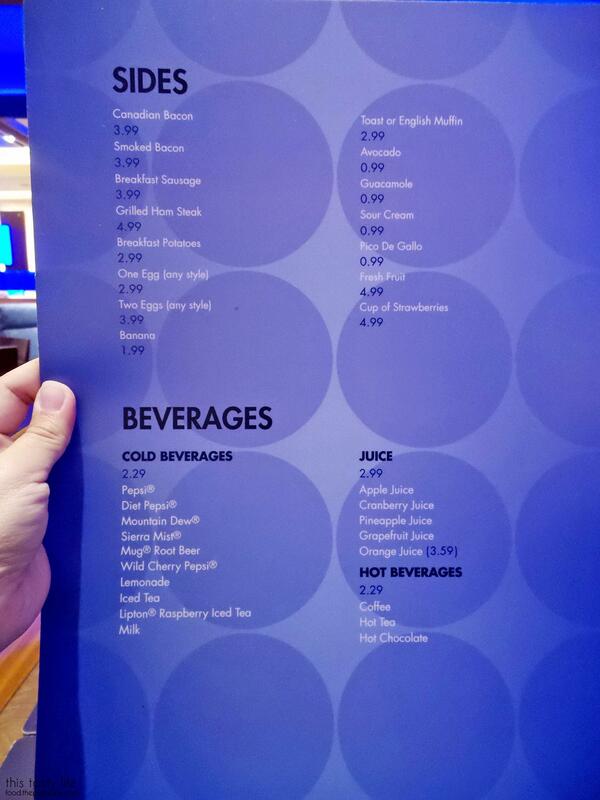 Harrah’s is pretty kid-friendly as well, though the kids still are not allowed to walk through the main casino floor (they must stay on the edges of the casino). The Cafe at Harrah’s Rincon is nicely decorated as well. Plenty of booths and feels pretty cozy. 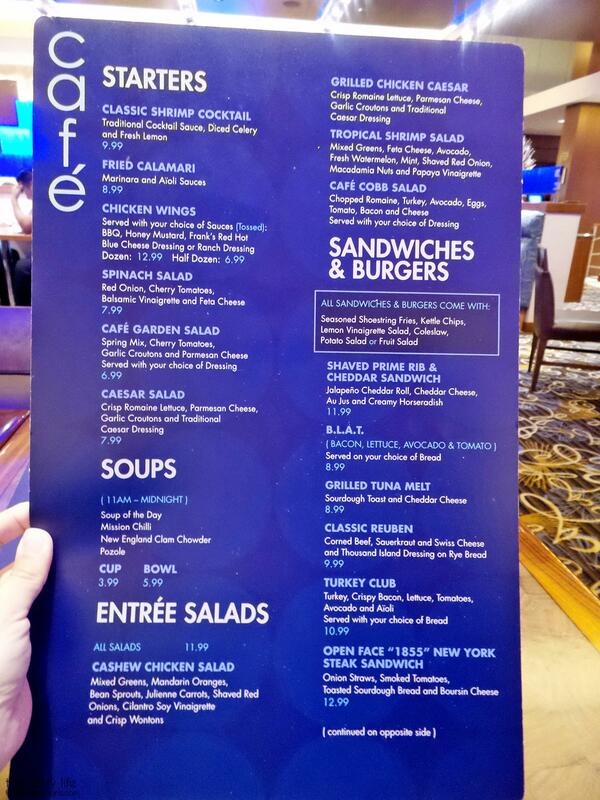 Menu time for the Cafe at Harrah’s Rincon! Click the menu photos to get an easier-to-read version. 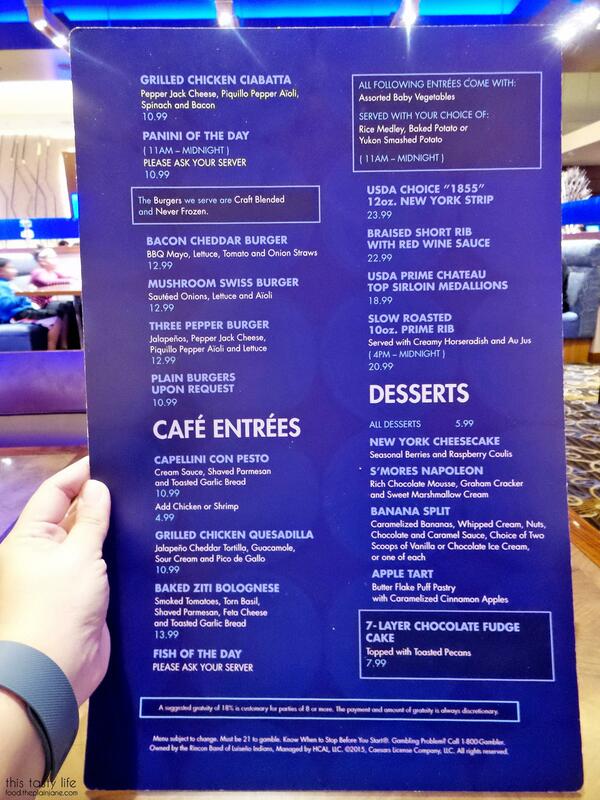 The Cafe at Harrah’s Rincon serves mostly American food – it’s almost diner like in the style of food they serve. Breakfast menu. 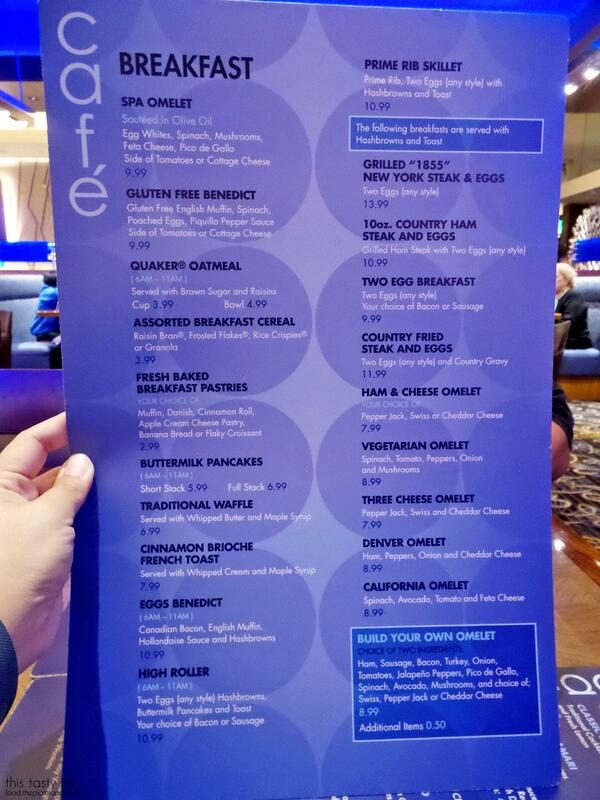 Some breakfast items are only available in the morning. 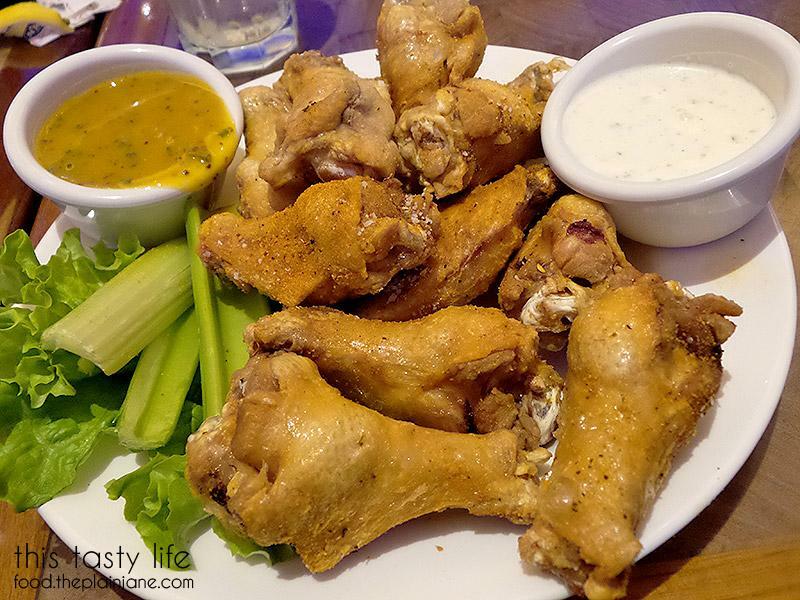 We started off with a plate of a dozen chicken wings (you can also get a half order for $6.99). The wings can be tossed in BBQ, Honey Mustard, or Frank’s Red Hot Sauce and our waitress also asked if we just wanted them plain. That sounded like the best idea to me so we got the chicken wings naked with two different dipping sauces: honey mustard and ranch. Jake and T pretty much fell over themselves and raved about the honey mustard sauce. T proclaimed it to be the “very best honey mustard sauce” he’s ever had. I thought it was good but not as good as he says. I think he’s overdramatic sometimes. Heh. I really liked getting the wings plain – the wings stayed much crunchier than usual. These wings were a pretty good size and had a nice amount of meat on each wing. I was sad it was mostly drumettes with very few wingettes (I had to look up what that part was called – wingette or flat!) which are my favorite part of the wing. The wingettes are totally covered in crispy skin and always taste more tender to me. Both the ranch and honey mustard were tasty sauces for the crunchy wings – perhaps naked chicken wings will be my new go-to way to eat wings! For dinner, Jake decided he would try the Capellini con Pesto. 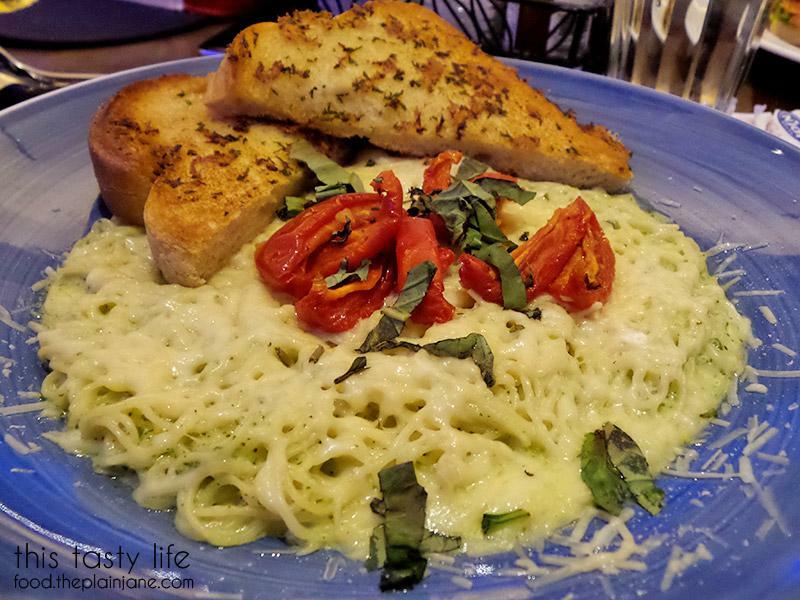 Capellini is like a very thin version of spaghetti. Neither of us knew that beforehand. I personally don’t like thin pasta like this (angel hair is my least favorite pasta ever) – it always tastes overcooked and almost mushy to me. The pesto flavor seemed really light on this dish and it tasted pretty bland. Jake ended up adding salt to boost it up a bit but I still felt like it was severely under seasoned. The toast that came with the pasta was good though – I stole some of that from Jake. T got a BLAT sandwich, which in case you didn’t know is a Bacon, Lettuce, Avocado and Tomato sandwich. He got it on sourdough bread with a side of kettle cooked chips. 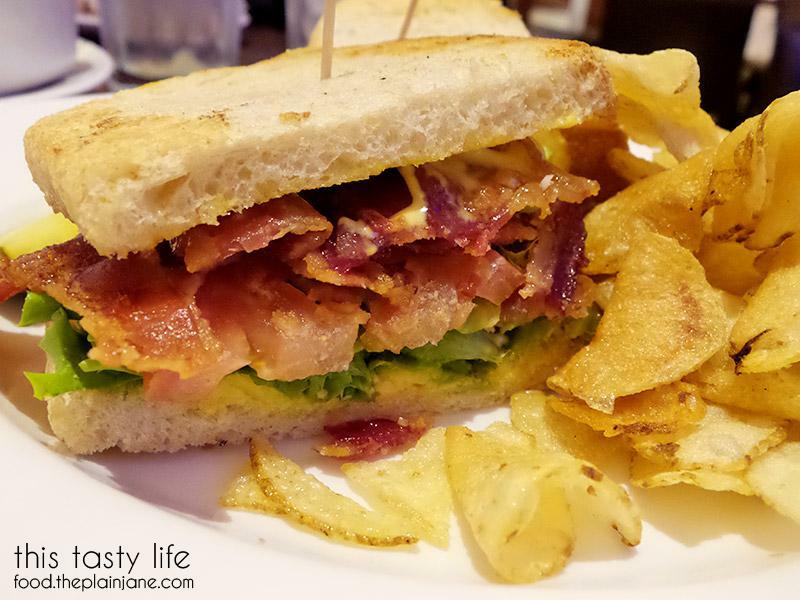 There was a good amount of bacon on the sandwich – a solid choice. 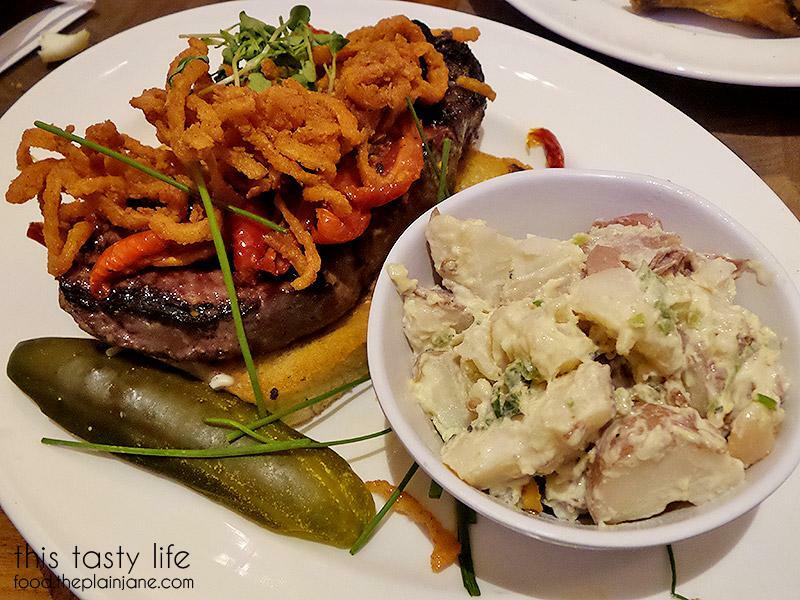 I wanted to get something a little different from what I usually get and I surprised Jake by ordering the Open Faced “1855” New York Steak Sandwich. He kept trying to guess what I was going to order and he didn’t manage it this time (though T said he guessed it right before I ordered it – ha!). With all the sandwiches you get your choice of side: fries, kettle chips, lemon vinaigrette salad, coleslaw, potato salad, or a fruit cup. I asked the waitress if there were any pickles in the potato salad and she said no, but told me there were jalapenos in it. I said that was fine, thinking it wouldn’t be a big deal. But after one bite of potato salad I abandoned it – it was much too spicy for me! They must leave all the seeds in because it was inedible to me. I also didn’t like the big chunks of potato anyway – I prefer my potato salad to be creamy and almost like a cold version of mashed potatoes. 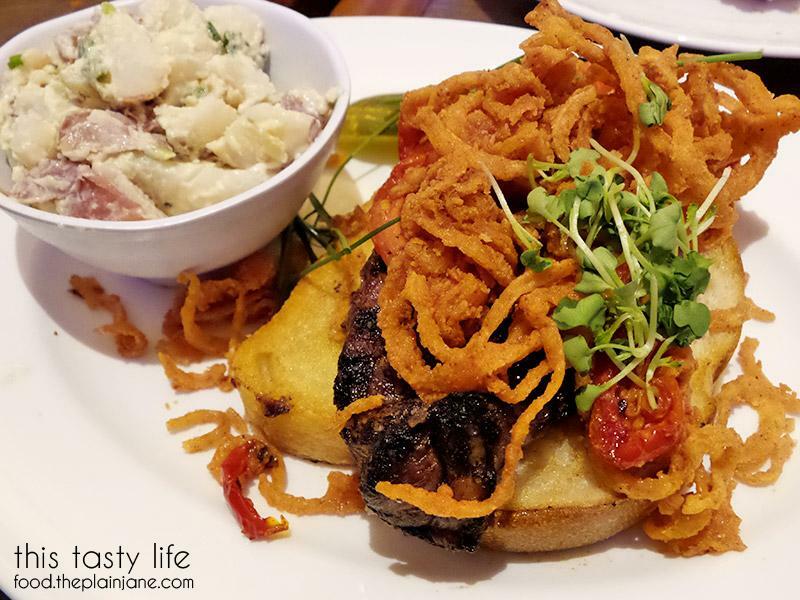 The open faced “sandwich” is pretty much just a cooked steak on top of a piece of thick toast with roasted tomatoes and onion strings. I thought the steak would be steak slices for some reason – but nope – it was a whole steak! The steak was cooked to medium rare – though once I got mostly through the steak I saw it was more towards rare on one side of the steak. I wasn’t bothered by this since I ate the “good” part already. The steak was nicely seasoned and juicy – I enjoyed it quite a bit. Mostly I just ate the steak on its own. The steak made the bread pretty soggy and moist and I don’t enjoy eating soggy bread. The onion strings were heavily coated in batter. I could barely taste any onion flavor at all and they were too salty and not very crispy. I asked the waitress (actually, Jake asked for me) if I could get a fruit cup since I didn’t like the potato salad. 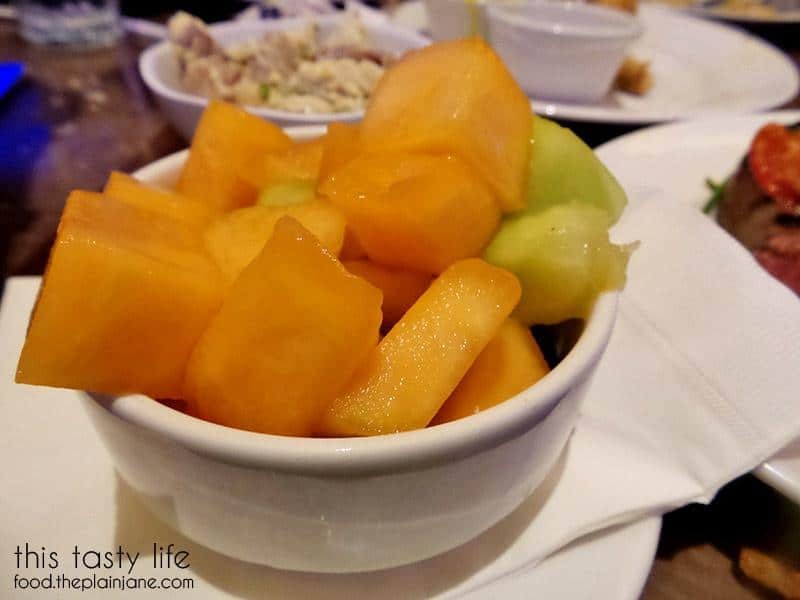 The cup was filled with chunks of cantaloupe, honeydew, and grapes. Not quite in season yet, but still better than the potato salad. Now you can see why this sucker is so heavy. SEVEN LAYERS BABY! The Cafe at Harrah’s Rincon has one-upped Claimer Jumper by offering a 7 layer cake instead of their measly 6 layers (psh)! Because why the hell not, right? 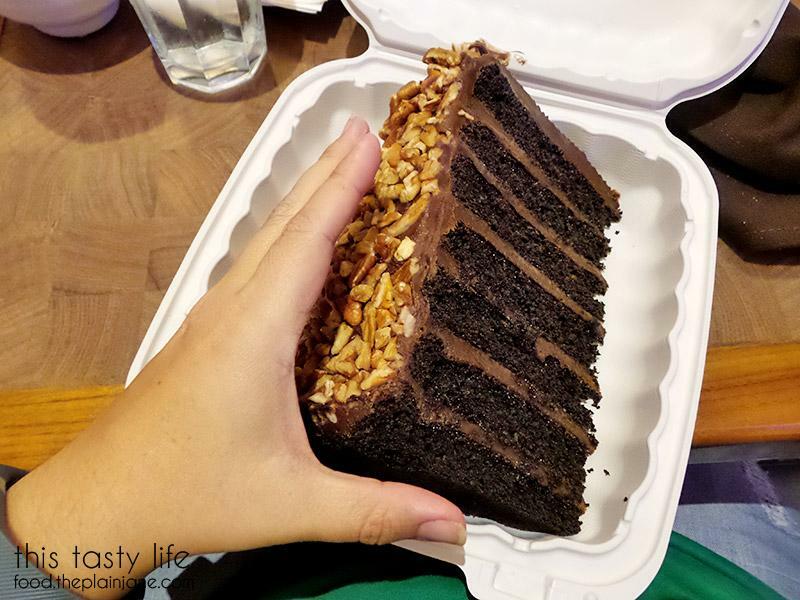 My hands are kind of small but still – that is a big piece of cake! 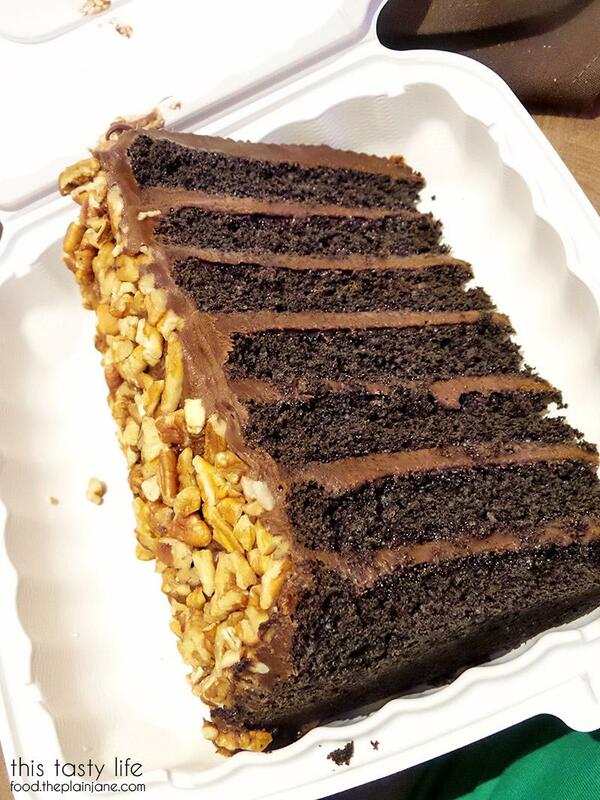 There are toasted pecans on the side which was my favorite part of the cake – chocolate goodness with crunchy nuts. This cake was incredibly rich and extra fudgy. Jake had one bite and that was enough for him. T and I tried to tackle it for the next couple of days but never managed to finish it. We accidentally left it in the mini fridge in our room when we left, but that’s okay. T and I got our fill of chocolate cake that week! The cake tasted much better at room temperature. It was difficult to eat if you ate it straight from the fridge since the fudgy frosting hardened up. The cake could have been a little more moist, too, but it wasn’t too bad. Definitely a dessert to share with a bunch of people! 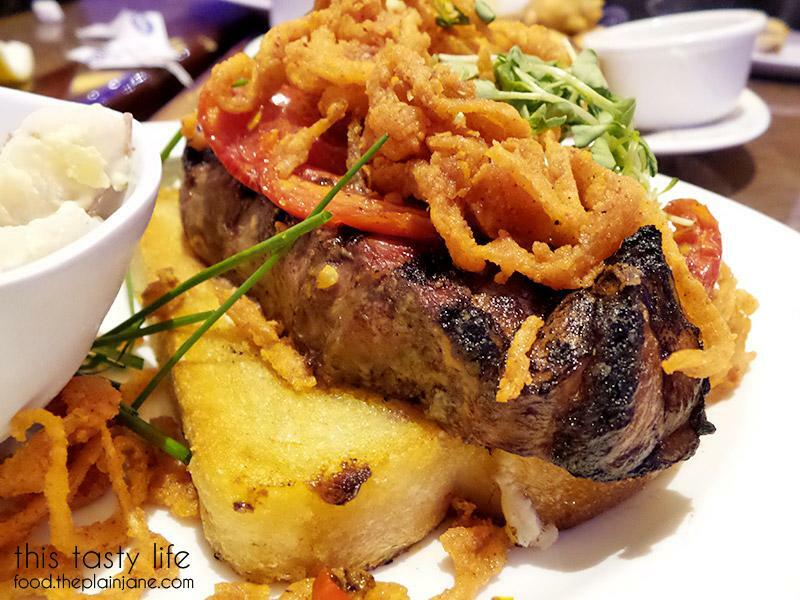 We visited a couple of other places to eat at Harrah’s Rincon – stay tuned for those posts! This blog is a creative outlet for me and my need/desire to write. With a journalism degree in my back pocket, I wanted a fun way to express myself and got into food blogging one day when my friend, Alyssa and I started photographing all of the food we ate. By day, I am a front end web developer and in my off-time I like to bake, cook, and explore new foods! My boyfriend, Jake, is heavily featured in my posts. His kids sometimes make an appearance as well as my friends and co-workers. I write the way I talk, freely and openly with a bit of humor and snark. 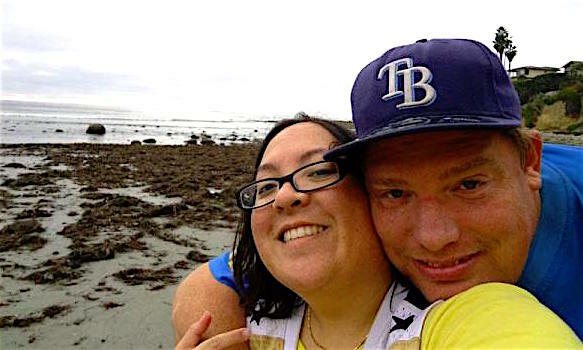 I hope you enjoy reading about my adventures in San Diego. You can email me at maryd at theplainjane.com (remove the spaces). I accept proposals, advertising inquiries, product review and restaurant review inquiries and more. Just contact me and we can discuss it. 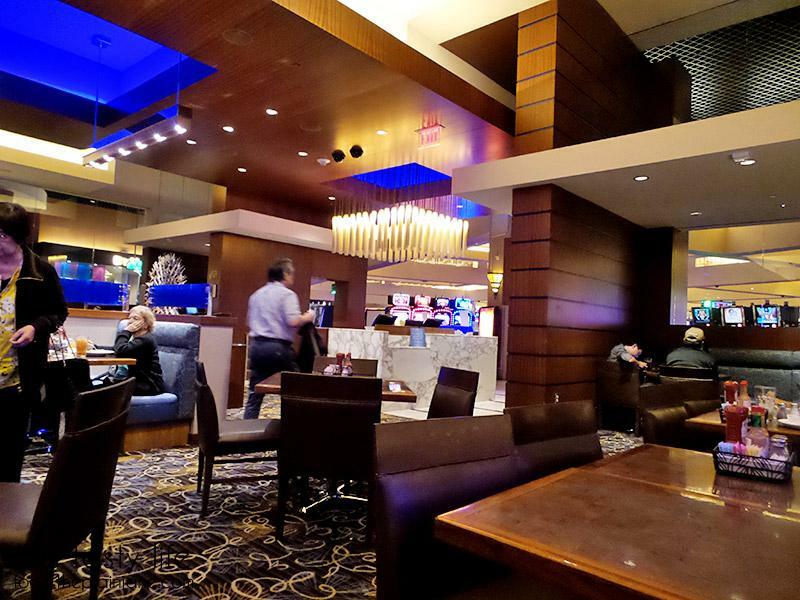 Be the first to comment on "The Cafe at Harrah’s Rincon Casino"